The Trivago Guy 2.0 experiment has been released upon the world, like a suave Frankenstein monster with a great haircut and a nicely ironed black dress shirt. A media release from Trivago on Tuesday hinted at new swag for spokesman Tim Williams, who was finally ready to show off his new digs. The results will blow your mind away (mind attached to person with extremely low expectations is mandated). There you go, America. Rather than the RoboCop/Terminator/George Clooney beast we expected, we get just a really dapper Williams. It’s like dad came home after shopping and getting a haircut. With slightly disheveled hair, lack of belt, a depressing dress shirt—unbuttoned just enough to highlight the man’s apathy for the mere thought of an undershirt—Williams looked like a father of six coming back from an exhausting vacation to Disney World. He is essentially wearing whatever Indiana Jones dons when he is unwinding on a Sunday in front of the television. The only thing missing might be Dorito stains…or an actual bag of Doritos. 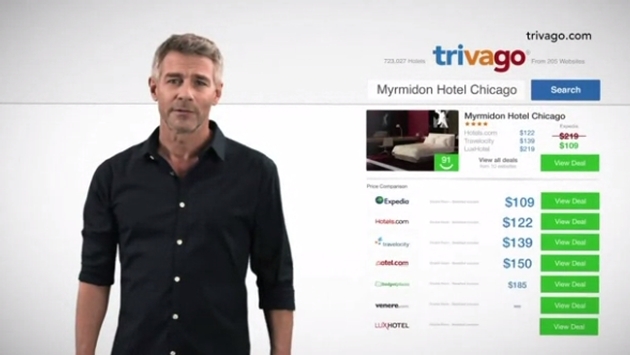 Now we, the concerned public at large, get dressed-and-showered Trivago Guy. While we still see signs of Mr. Guy’s staunch anti-shaving stance over his face, we will assume there is now a general uptick in the world’s affairs. Trivago Guy now sports a black shirt, allowing him to better walk slowly to the camera as he speaks in a soothing tone. If this doesn’t improve the economy and end global warming, well we are plum out of ideas.